Last year, for a cooking contest at work, I made a maple-bacon fudge that delivered 200% on the infamous salt-sugar-fat triad. I wanted to make it again for Christmas, but because I recently gave up eating animals smarter than a dog, I had to figure out how to replace bacon’s salt/fat contribution. Recently, while cruising the aisles of the new Wheatsville Co-op in South Austin, I found something in a bulk bin that I just had to try — mesquite-smoked pecans from the Pecan Shop of Waco, Texas. I bought a few to snack on. The pecans had a slightly salty, heavily smokey flavor that was good, but a little overwhelming. It occurred to me that mixed up in something, the nuts might add a nice smokey element. And then it hit me. Bacon! 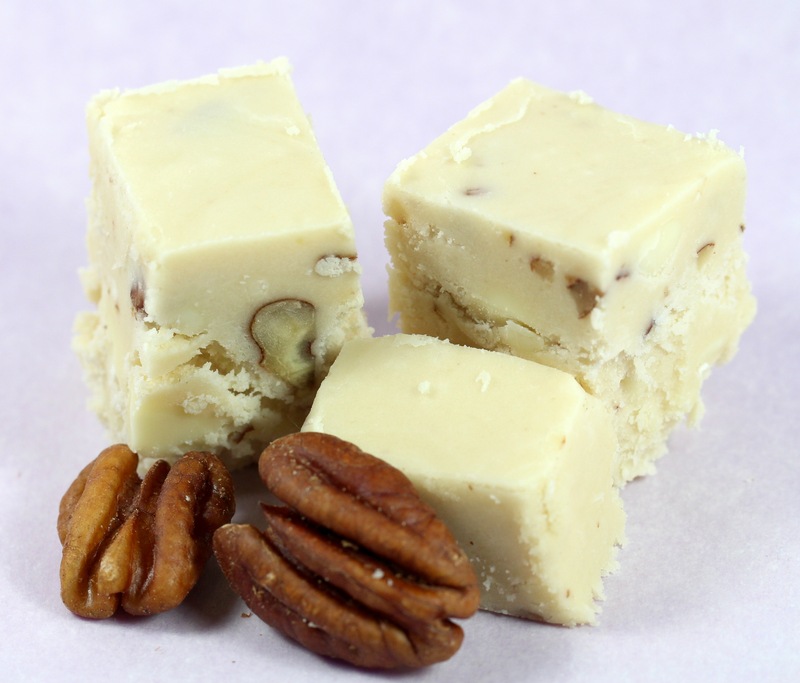 When I made the maple fudge last week for some post-Christmas celebrations, I added some chopped smoked pecans. I didn’t miss the bacon at all, and neither did anyone else who tried it. Pecans have almost as much fat per ounce as bacon (20 g for pecans vs 23 g for bacon), so the fat component was there in spades. The very slight amount of salt on the pecans and the maple syrup completed the addictive trio of flavors. Heat sugar, butter, syrup, and milk over medium heat to a full, rolling boil in 3 qt. heavy sauce pan, stirring constantly. Boil on medium heat until the candy thermometer reaches 234 degrees F, stirring constantly. Take the pan off the heat and add the chips to the mix. Stir in the marshmallow creme and chopped pecans. Stir until the mixture thickens and starts to look dull, and pour it into the foil-lined or buttered cake pan. Let it cool for a couple of hours, then cut it into bite-sized squares. Store the fudge in air-tight containers.